I have a problem with this configuration and can't figure it out on my own. 1: Bulb1 and Bulb2 white and black wires connected to light switch black and white wires. Copper wire connected to junction. I Turn power on, turn switch on, no light. 2: Bulb1 and Bulb2 white and black wires connected to breaker white and black wires. Copper wire connected to junction. Turn on power, lights come on, but switch has no control. Note: I have tested continuity on the switch, and its wires. There is no problem with the switch. Also the light fixture is brand new. And the light bulbs are tested working fine. The easy answer is "Hook it up just like the previous light was hooked up", but I'm assuming that you didn't keep track of the original configuration. To make it work again, connect both of the lamp white wires to the white wire coming from the circuit breaker panel. Then connect the black wire from the panel to the black wire leading to the switch. Then connect the white wire from the switch to both black wires of the lamp. Then, make sure you mark both ends of that white wire with black (tape, pen, paint, etc) to show that it's a switched hot so someone doesn't confuse it with a neutral some day. If that's really how the wiring is running through the building, you need a "switch loop" configuration. Hot (black) to light box to switch; switch output (white relabelled black or red) to lamp hot (black); lamp neutral (white) to neutral running back to the breaker box (white). The bare copper wire from the lamp is a safety ground, and should be attached to ground running back to the breaker box (may be bare copper, green insulation, or the conduit if the wiring was in conduit). Usually if the ground is a wire it will be attached directly to the lamp's electrical box via a screw; you can attach the lamp's ground wire to the same point. I think the black from the breaker should go to the black from the switch. Then the two whites should hook into the light. The white from the switch will now become the hot/positive wire. (Or the exact opposite is true... I'm not sure if it matters.) At any rate... the circuit need to flow to the switch. without seeing the fixture, I'm guessing it doesn't matter which positive/negative hookup on it you use, as they are probably connected. MAKE SURE BREAKER OFF AND GROUND/COPPER IS SECURED. 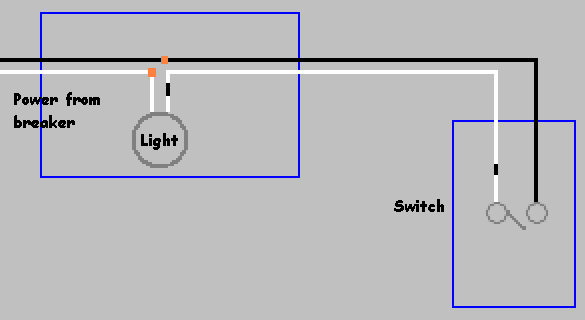 How do I connect a new fixture to a box with two black and two white wires?